Dr. Lapinsky obtained his medical degree from the University of Witwatersrand, Johannesburg, South Africa, where he also trained in Internal Medicine. 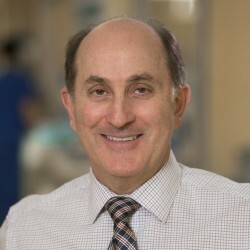 He went on to training in Pulmonary and Critical Care, and subsequently completed a Clinical Fellowship at the University of Toronto, before coming on staff at Mount Sinai Hospital. His clinical practice involves attending in the ICU and on the Critical Care Response Team, as well as an ambulatory Respirology practice. His clinical and research interest is in the care of pregnant women with respiratory or critical illness. He currently acts as the Chair of the Research and Academic subcommittee of the North American Society of Obstetric Medicine. He has published over 100 articles, more than 20 in the field of the pregnant patient. Lapinsky SE, Tram C, Mehta S, Maxwell CV. Restrictive lung disease in pregnancy. Chest. 2014;145:394-8.